Reviewed by Rick Wallace . 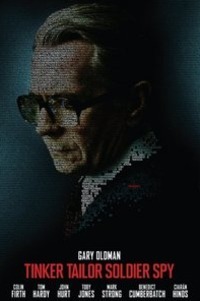 A bungled intelligence mission in Budapest; the forced retirement of both the head of the British Secret Service, Control (John Hurt), and his right-hand-man, George Smiley (Gary Oldman); a growing suspicion that there may be a mole near the top of ‘The Circus’. These are the building blocks from which Tomas Alfredson (Let the Right One In ) constructs this exceptional modern spy drama. Moving from London to Budapest to Istanbul and back again, the film unfolds at a languid pace, the urgency of the operation juxtaposed against the ageing spies conducting it. In terms of pacing and character, this feels like the spy genre being forced out of, and then maybe back into, retirement. Painting a bleak picture of a Secret Service populated by paranoid operatives and skeletal leaders - John Hurt looks as if his character started to decay long before he was forced out - this is a million miles away from the glitz and glamour of James Bond. The muted palette, drab scenery and cigarette smoke are atmospherically captured by the snail-paced camera, and the Secret Service of the early 1970s feels here like a fully-realised world. The sense of disorder within the Service itself, highlighted by the situation with the mole, is reflected by the lethargy and helplessness of those involved, from the top - the current Head of the Service, Percy Alleline (Toby Jones), and the Government Ministers - to the back-room boys and low-level field operatives at the bottom. Not only through plot but also via style and pace, the film conveys a sense that the Service is in both a figurative and literal mess. Perhaps the biggest fear for those familiar with the BBC’s 1979 adaptation of John Le Carré’s novel was that Alec Guinness’ portrayal of George Smiley captured the ex-spy so completely that it was inconceivable that anybody else could succeed in the role. Oldman does an admirable job of banishing the spectre of Guinness from the mind of the viewer, and his portrayal of Smiley as calculating, cold, yet not entirely emotionless, is gripping. The acting from the fine ensemble cast is similarly superb, with Tom Hardy’s performance as the increasingly paranoid and frantic field operative Ricki Tarr providing much of the adrenaline that drives the second half. Overall the film is a great success. However, with the exception of Tarr, Smiley, and his associate Peter Guillam (Benedict Cumberbatch), we do not spend quite enough time with the other characters to engage with them on an emotional level (more on this in the Alternate Take). The only major failing of the film is thus potentially a big one, as it is difficult to care for any of the possible ‘moles’, meaning it is ultimately hard to feel that the identity of the double-agent matters on a personal level. Nonetheless, regardless of how slowly it unfurls, the process of the investigation is thrilling, and the back-stabbing, deception and double-crossing - even from our ‘hero’ - are both tragic and compelling in equal measure. This review was published on September 24, 2011.